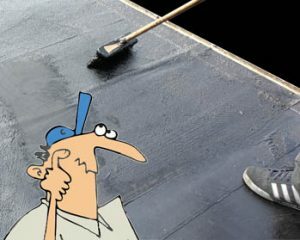 Bitumen roof paint is probably one of the cheapest and easiest repairs you can make to a flat roof. It really couldn’t be more simple, and it’s an easy DIY task for most homeowners as long as as you can work safely at height. First lets take a look at the materials involved. Bitumen flat roof paint – In case you haven’t seen it, in this video I show you how to apply a waterproof bitumen paint coating to a flat roof. Bitumen paints are probably the cheapest and easiest of all the paint on, or brush on waterproofing paints. The first thing required is a clean dry surface, and I highly recommend the thinnest coat of bitumen primer as a base. Bitumen roof paints usually come in either water based, or solvent based varieties. Having used both I consider solvent based to be the best option most times, not only does it dry faster for recoating if necessary, but it’s waterproof quicker, therefore rainproof faster. A bitumen sealant will bond and adhere to most things including, built up felt roofs, asphalt, concrete, asbestos or cement sheeting and metal sheeting including lead, zinc, galvanised steel and iron. Oh and slate roofs believe it or not. You can expect a bitumen based roofing sealant to cover 1 metre per litre, per coat. The flat roof in my video was 12m², took two coats, and used nearly the whole 25 litre drum. So how long can you expect a bitumen coating repair to last on a flat roof. Well this really depends on your flat roof. If it has multiple movement cracks and is still prone to excess movement, lets say the timber underneath is slightly rotten, it will have a detrimental effect. I’ve seen this repair last 12 months, and I’ve also seen it last well over 5 years, 10 in some cases. Of course you can implement a scrim or simply apply two coats, and solar reflective paint which will also help. And of course there’s nothing to stop future subsequent coats of roof sealant. When using a bitumen primer the game is to get it on, and then spread it out nice and thin with no puddles or thick spots. Coverage will be a bit random depending on roof cracks or absorption, but you can expect between 4 to 6m² per litre. Adding a Solar reflective coating to a flat roof that has been sealed with a bitumen roofing sealer really serves two functions. First it keeps off the UV light, this stops premature drying out and damage of the sealant. Secondly it reduces heat build up, not to mention the finished roof looks a lot better. Dont worry about the overly shiny silver look when fresh, this will dull down to a pleasant grey in about 2 or 3 months. In coverage terms it goes a long way at about 5 to 10m² per litre. I would say the vast majority of flat roofs that get bitumen coatings do not receive a layer of scrim. That’s reflected in how hard scrim can be to purchase, even in very good roofing yards. It’s also I think overpriced at about £80 per roll. In the video I used Cromar glass fibre scrim, although other scrims also work. A scrim really comes into it’s own when the roof has multiple splits as found in seriously degraded built up roofing felts.